So here it is. The final page. It's a pretty typical glen short story. The ending kinda comes out of nowhere and this one has a little mystery to it. This story is going to link the first and second arc of Sam together. So it might not make sense right now, but in time it will. Artistically I like this page. I really like what I did on the panel on the bottom. It's supposed to be blood on the grass, and even though it's really kind of abstract I think it works. 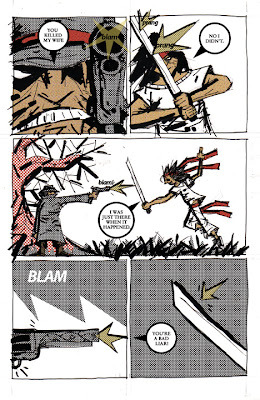 I really like the floating hand panel and the panel of Sam holding the sword next to it. The middle face shot I'm not crazy about. It's a little funky looking, but oh well. Hope you enjoyed this feature, i'll see if i can put a story together like this again sometime. Commentary Time: So this page is probably my least favorite page of this little experiment. It's mainly just because of Sam looks retarded up there on the left side. 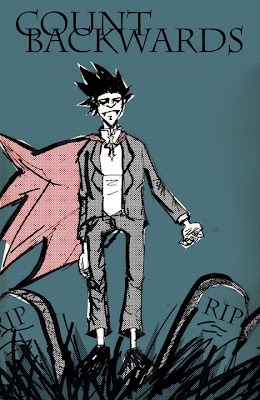 I actually really like the other panel of him though. 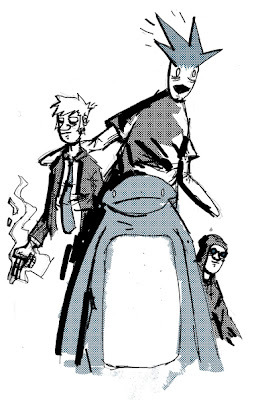 The bullets panel turned out kinda average, I like it some what. Story wise this panel starts to explain what these two have been going on about for the last 4 pages. I threw that little part about Sam destroying Nates favorite gun in for my friend Travis, or at least I was thinking about him when I wrote that line. Here is the 4th page. I consider it to be the first real story page. I tried doing a lot with this page. 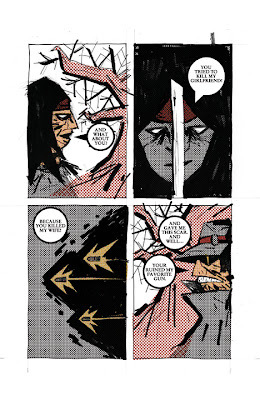 The first panel is basically the a small version of the 3rd issue cover of the new lone ranger series, but with my own twists. I used a lot of my signature panels on this page, like the zoom ins on the weapons, and long pan shot above them, where it shows the characters fighting in profile. So Page 3. Alright. Halfway point. This is my favorite page of the short. This page got redrawn like 4 or 5 times. I really had to work on the pose of Nate. I just couldn't get it right. I just kept changing my idea on how I wanted it to look. 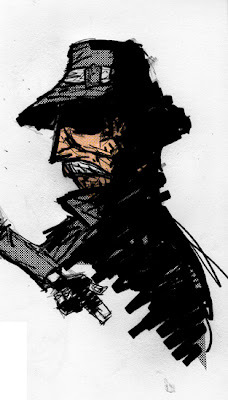 To formulate the look of Nate I took a lot from Ben Foster's character from 3:10 to Yuma, and from the new Lone Ranger comic series, oh and what I said last page, Revolver Ocelot. Page 002: This is the commentary. 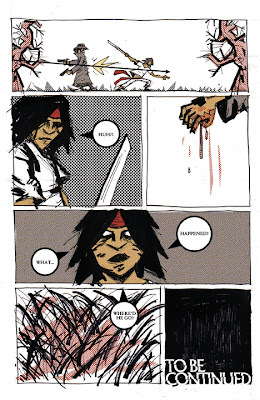 On this page my goal was to introduce the other main character of this story, and to really keep up up with that strange out of context dialouge. Again it will all make sense later. I experitmented a lot with background elements in this story (something I don't do a lot). The tree is the the obvious one in this story. 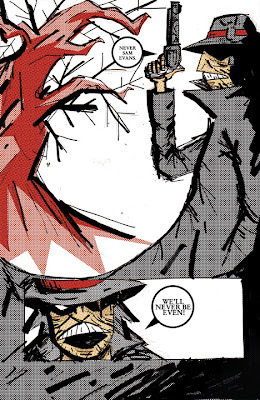 The character design for Nate came a lot from Revolver Ocelot from Ashley Wood's Metal Gear Solid series. More commentary. So you probably won't be able to read this page without clicking on it and enlarging it. I wanted a panning out effect for this first page. 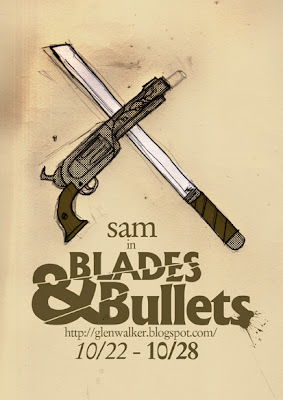 When I first wrote it, I just had those three panels, of Sam's face, but when I came up with the title, I added the shots of the weapons, to help bring it together, and add some pacing. I wanted to do a story that is super out of context, so that if you read it right now, it makes almost no sense, but when you read it with the full story in the future, it makes perfect sense. It begins today. I've got a little sort of DVD commentary going on, it's gonna go on down here. 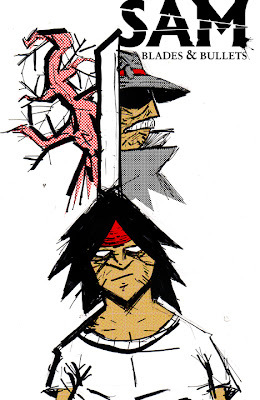 I'm gonna talk about what I did for the page and the story, and such things. This is the cover. I wanted to do one of those covers where all the smaller elements spring from the main elements. I kind of wish I had added a gun or some bullet's into it, but I couldn't make it work. I actually did a slighty different version at first, then scraped it and did this one. I'm thinking about posting that over at Deviant art, so look for that. Check back for the first story page tommorrow. It's official. I've alrady completed four pages for it, HOpefully I'll have a fifth done by tonight and the sixth tommorrow, so I'll only have to do get one done during the week. Enjoy this little promo thing I did for the short. 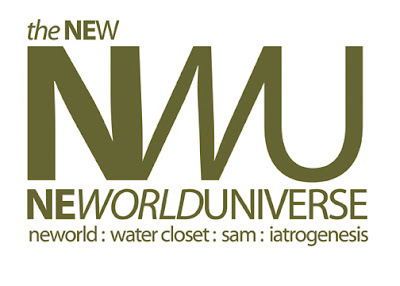 So we finally have a name. You can see it up there in the title. If your to lazy to look it's IATROGENESIS. Me and Devin traded scripts again. I'm busy working on rewrites right now. The script was still a little thing, even after Devin's new additions, so i bulked it up a little more today. It's going really well. I feel like we are really close to finishing the first scipt. 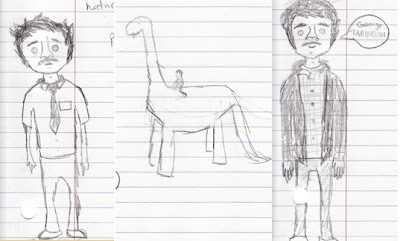 What's pictured here are more concept sketches. I know I said I had it on lockdown, but that turned out not to be the case. (I don't think devin liked my new character design much, but to be honest I didn't either) Devin ended up sending me more sketches. You can see some of his up there, and one of mine. 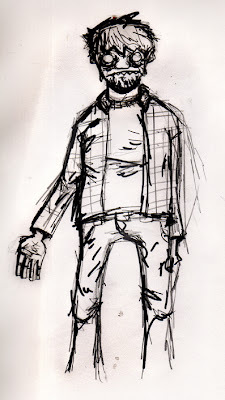 Here is a sketch for the antagonist for the first short story of Sam. I decided that I'm going to push myself to starting the week long comic on Monday. So what the deal is, is that on Monday I'll post the first page, and I'll post a page everyday till Sunday which will have the last page. So look for that. I'm going to try to get 2 or 3 pages done this weekend so I'll have a big head start. So that 50th post extravaganza was pretty cool huh. Yah it was. Well moving on. So I've been wondering what I want to do now that volume 1 of the Water Closet is in the can (so to speak). My first instincts were to do volume 2 (which I have many ideas for) or go back to neworld. Well I don't think I'm gonna do either. 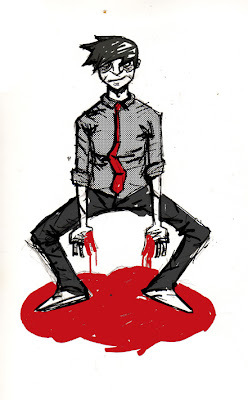 I had planned to do the SAM story as part of the water closet, but I started writing an outline for it today, and realized that it needs far more attention than just a single issue. I've already outlined two issues, and am working on the outline for the third, plus I have already written a short story for it as well. 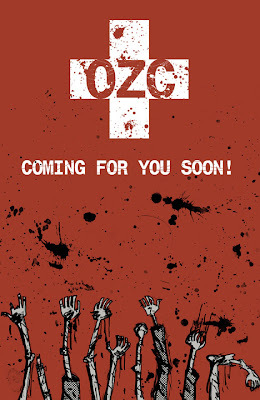 On top of all this I've also already completed the script for OZC. And on top of all that I've got the comic that I've been working on Devin. This is essentially 3 scripts that I have floating in the air. I feel like I really need to choose one, but at the same time I feel like working on all 3 at once may be fun as well. Because of the fact that Sam and the project with Devin are both longer projects , it might be nice to have several things going on at once, so that if I get bored I can move onto another one for awhile and go back. If I were to go with my gut I think I want to go with Sam, but only time will tell. Right now I'm going to work on the 6 page story I wrote for Sam, and I'm going to continue with Devin on our project, in a couple weeks I think I'll have a good idea on what direction I want to go. P.S. I know I said I wouldn't do much talking in this thing and that it would be mostly pictures, sorry for that. This was a one time thing I hope. But I am deciding what I'm going to be doing for the next few months, so I think this takes some serious thought. P.P.S. 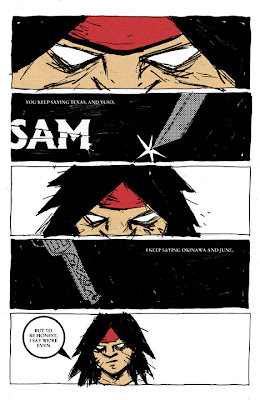 Also, when I get a good lead on the Sam short story I will be posting a page a day in here. So everyday for a week you'll get a page, and by the end of the week, you'll have the full story. How cool is that? Well I think it is. Yes! Yes! Yes! 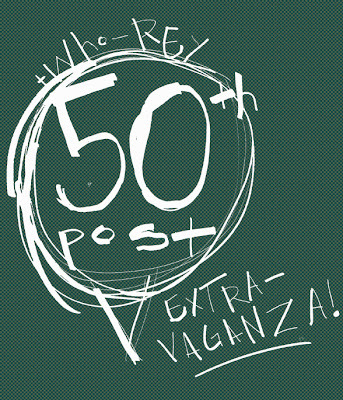 Welcome to 50th Post Extravaganza! Can't believe it's been 50 post already? Me neither. I've got some big news. On the night of the 50th post, I have almost completed the first volume of The Water Closet. What a co-winky-dink huh? Yup, how cool is that. I finished the last page today (after throwing out numerous pages, which I didn't think were good enough for the art book). I'm done and I've got a whole bunch of extras for the blog post today. 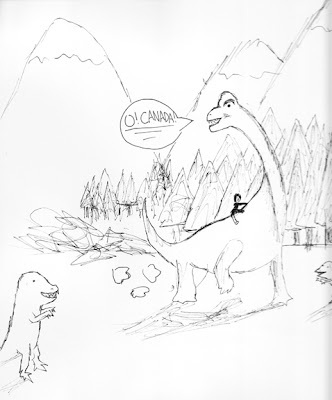 First off we have an exclusive page from my upcoming art book Loo. 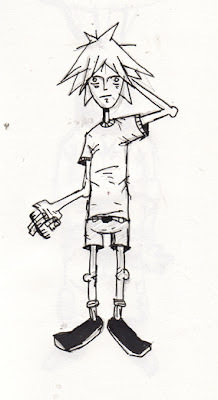 Next we have a sketch from my sketch book that I did up for the big event which is this post. And lastly I have a super cool desktop background that I made from one of the pages from Loo. I really love the background it turned out really cool. I hope some people will use it. So that's it. The first volume of Water Closet has been a great time. Check back tomorrow and subsequent days for what the future holds for the Water Closet. Here is a blog exclusive. It's been a while since I've posted something in here I did specifically for the blog. It's of my new character Sam. 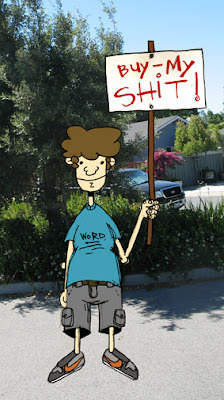 I'm thinking about about doing a 4 or 5 page short for Sam. So look for that maybe in the future. I'm really close to finishing the art book as well. Look for that in the close future as well. 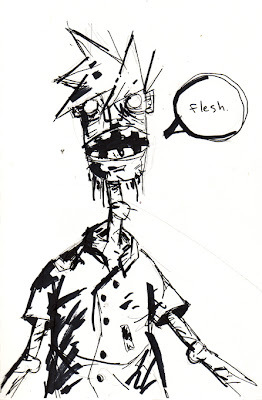 Some more crazy stuff from my sketchbook. I think this one is going in the Art book (which is almost done by the way). These is loosely based off the spring show poster I did last year, and I also got a lot of the ideas from an artist off of deviant art. 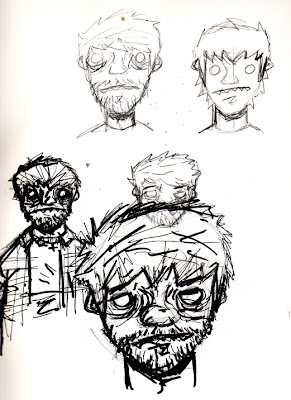 Here are more gems from my sketch book. Small sketch book this time. The one I work on a lot at school. 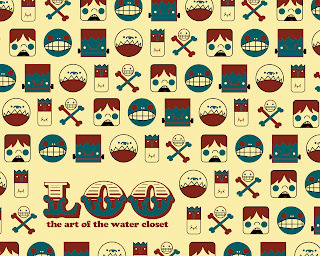 So after much procrastination I've begun working on the Water Closet Art Book again. It's officially called the Loo. I've actually already had a lot of it done. It should only take a little longer to finish it all. I finished all the additional pages like the inside covers and back covers and stuff like that. I say that it will probably be up in a couple weeks. Though a lot of it is already floating around the internet. 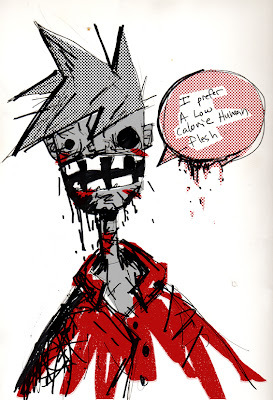 Enjoy this new page from the artbook. 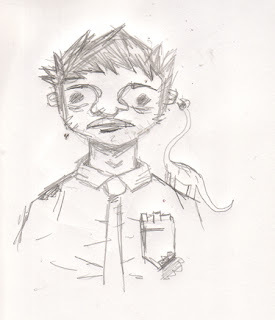 Here's a random thing from my sketchbook. Have fun. So after tons and tons of sketches I think I've finally locked down the character design of the character for me and Devin's comic. 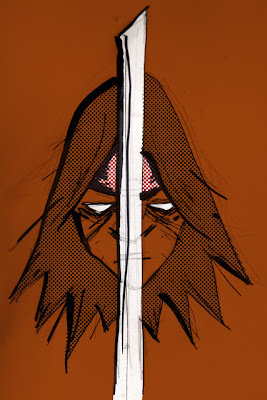 I've really got to work on some of the finer points of the design and the coloring method. I've been working on a logo for my brothers portfolio. Here is multiple versions of the logo and the process as well. This is a very funky drawing of a twin lens reflex camera. 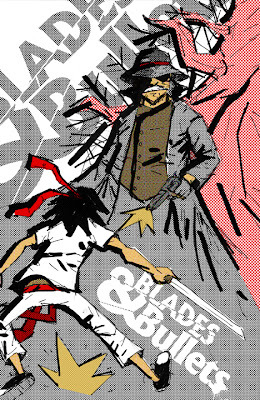 Here is a poster design I did for a poster series I'm working on for my portfolio. It's for classic horror movies. 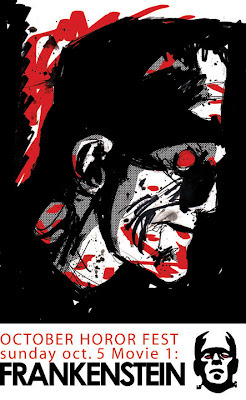 this one is of Frankenstein. I think it turned out pretty good. There should be more posters coming in the next few days. 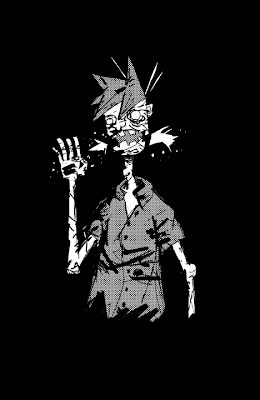 More zombies. I'm over halfway through writing OZC. It took a really cool turn today. I'm flying by the seat off my pants (no outline). So the writing comes a little more organically. We'll see where it goes. Complete randomness from my sketch book. These are all the characters from Billy's Adventurers Club riding crazy animals. 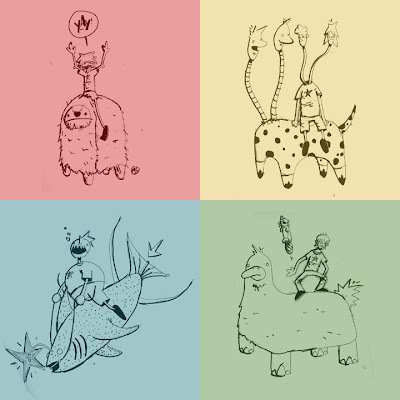 I kind of like these drawings. 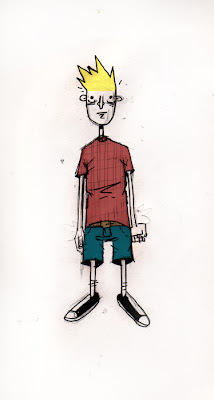 Check some new sketches for the series I'm working on with mr. Devin Askounis. We've been trading scripts back and forth. We're working out the kinks for the first issue. It's turned out pretty good so far. I've been writing all day, on various things. Though it feels good to be writing again. I'll probably start doing pages in a couple days. 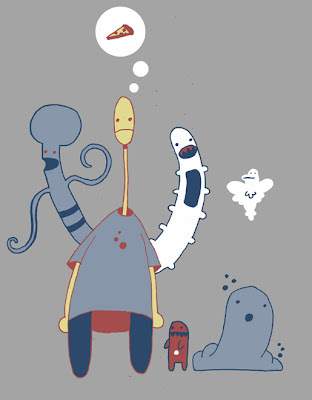 I've got to work out the characters visually.